(Rick Egan | The Salt Lake Tribune) Gonzaga Bulldogs head coach Mark Few answers questions from the media during a news conference at Vivint Smart Home Arena, Friday, March 22, 2019. (Rick Egan | The Salt Lake Tribune) Gonzaga Bulldogs head coach Mark Few answers questions from the media during a news conference at Vivint Smart Home Arena, Friday, March 22, 2019. (Rick Egan | The Salt Lake Tribune) Gonzaga Bulldogs head coach Mark Few answers questions from the media during a news conference at Vivint Smart Home Arena, Friday, March 22, 2019. (Rick Egan | The Salt Lake Tribune) Gonzaga Bulldogs head coach Mark Few answers questions from the media during a news conference at Vivint Smart Home Arena, Friday, March 22, 2019. (Rick Egan | The Salt Lake Tribune) Gonzaga Bulldogs forward Corey Kispert answers questions during a news conference at Vivint Smart Home Arena, Friday, March 22, 2019. (Rick Egan | The Salt Lake Tribune) Gonzaga Bulldogs forward Corey Kispert and guard Zach Norvell Jr. answer questions during a news conference at Vivint Smart Home Arena, Friday, March 22, 2019. (Rick Egan | The Salt Lake Tribune) Gonzaga Bulldogs head coach Mark Few answers questions from the media during a news conference at Vivint Smart Home Arena, Friday, March 22, 2019. (Rick Egan | The Salt Lake Tribune) Gonzaga Bulldogs head coach Mark Few answers questions from the media during a news conference at Vivint Smart Home Arena, Friday, March 22, 2019. (Rick Egan | The Salt Lake Tribune) Gonzaga Bulldogs head coach Mark Few answers questions from the media during a news conference at Vivint Smart Home Arena, Friday, March 22, 2019. (Rick Egan | The Salt Lake Tribune) Gonzaga Bulldogs guard Zach Norvell Jr. answers questions during a news conference at Vivint Smart Home Arena, Friday, March 22, 2019. (Rick Egan | The Salt Lake Tribune) Gonzaga Bulldogs forward Corey Kispert and guard Zach Norvell Jr. answer questions during a news conference at Vivint Smart Home Arena, Friday, March 22, 2019. College basketball player of the year candidates Rui Hachimura and Brandon Clarke put up their usual big numbers on Thursday night as Gonzaga walloped Fairleigh Dickinson 87-49 in an NCAA Tournament first-round game. Potential NBA first-round draft pick Killian Tillie swooped in for a highlight-reel hammer dunk and added 17 points and Zach Norvell provided timely outside shooting. But the No. 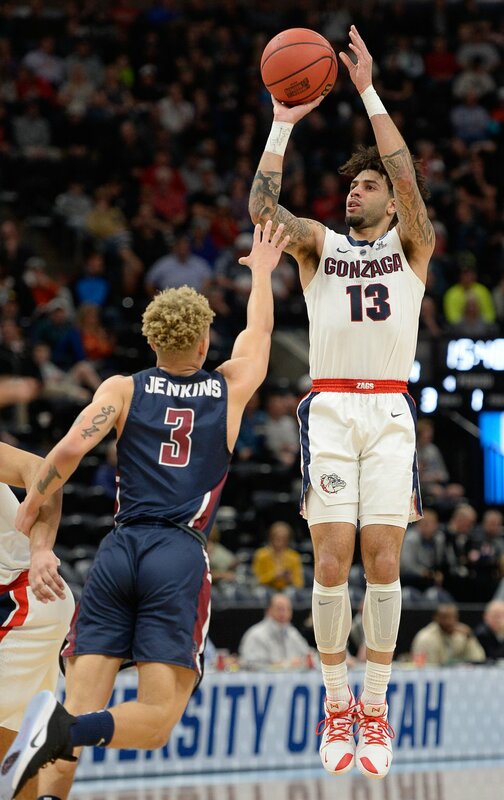 1-seeded Zags say the maestro behind it all — at least when they’re on the court — is fifth-year senior point guard Josh Perkins, who doesn’t get nearly the hype as the aforementioned Gonzaga stars but is generally the engineer behind it all. Having improved to 7-3 in NCAA Tournament games played in Salt Lake City, the Zags (31-3) will meet No. 9 seed Baylor (20-13) at Vivint Smart Home Arena on Saturday (5:10 p.m., TBS) in a second-round game, and Perkins will be there to orchestrate it all. Nicknamed “Hollywood” by his teammates because he enjoys the bright lights and attention perhaps as much as anyone on the squad, Perkins said Wednesday he’s OK with his role. He’s all about winning, he said, and getting the Zags back to the national championship game like they did in 2017. With his trademark unkempt hair and more tattoos than he cares to count — most of which carry inspirational sayings or depict influential people in his life — Perkins doesn’t shy away from the limelight. He writes “Prove Them Wrong” on the tape on his wrist before games. Like BYU’s quarterbacks are often scrutinized unfairly in Provo, Gonzaga’s point guards are in Spokane, and Perkins has felt the wrath of the faithful at The Kennel a time or two, such as that monumental 77-71 upset by BYU when GU was ranked No. 1 and on a 29-game winning streak. “He’s handled whatever criticism that has come his way like a pro,” Kispert said. Perkins said it just gives him “ammo” to get better. (Francisco Kjolseth | The Salt Lake Tribune) Fairleigh Dickinson Knights guard Jahlil Jenkins (3) tries to block a three pointer by Gonzaga Bulldogs guard Josh Perkins (13) as Gonzaga faces Fairleigh Dickinson in their first round menÕs NCAA March Madness tournament game at Vivint Smart Home Arena in Salt Lake City on Thursday, March 21, 2019. Backup guard Geno Crandall, a fifth-year graduate transfer from North Dakota, said Gonzaga’s offense is “high-powered and complicated” and Perkins is the perfect player to direct it. Kispert said Perkins is “really funny, really animated,” and always has a smile on his face, or a joke to tell, off the court. Perkins is from the Park Hill neighborhood of Denver, Colo., so his father, little sister and little brother have made the trip to Salt Lake City, where Gonzaga receives as much support as any non-Utah team that has ever played here. While Hachimura, Clarke and Tillie are likely bound for the NBA this year or next, Perkins’ future is less certain, but he wants to continue playing basketball for a living. Tipoff • Saturday, 5:10 p.m.
About the Bulldogs • They are 32-21 all-time in tournament games and 7-3 in games in Salt Lake City after defeating Fairleigh Dickinson 87-49 on Thursday in a first-round game. … The 38-point margin was their largest margin of victory in an NCAA Tournament game in school history. “I don’t know who in America could’ve played Gonzaga and beat them tonight,” FDU coach Greg Herenda said. … Forwards Rui Hachimura (20.1 ppg.) and Brandon Clarke (16.5) were both named to the national ballot for the Wooden Award. Hachimura had 21 points vs. FDU, while Clarke chipped in 12. Killian Tillie, who has played in only 12 games due to a foot injury, scored a season-high 17.